The pinnacle of Australian beef was on show at Hog’s this past week when it hosted the Australian Wagyu Association’s largest-ever Wagyu Branded Beef Competition at its Cleveland head office on March 14. Samples of Australia’s highest quality and most expensive beef, including numerous marble score 9 and 9+ (Australia’s highest possible) striploins, arrived from around the country for judging by a panel of the nation’s top chefs and commentators. 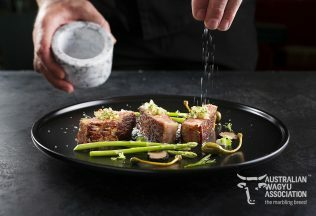 Hog’s Corporate Chef John Alexander, who’s also been the Executive Chef for the Wagyu Branded Beef Competition for the past four years, was responsible for the preparation and cooking of the esteemed entries. Chef John Alexander delivered the steaks masterfully, enabling the samples to express their rich complexity in strict accordance with the competition protocols, and showcasing the quality of Australia’s homegrown produce. “Whilst our signature steak is an 18-hour slow cooked Prime Rib, it’s important as a chef and representative of Hog’s to be abreast of what’s happening across the Australian Beef Industry,” said Chef John Alexander. The winners of the Wagyu Branded Beef Competition will be announced during the Association’s annual conference in Adelaide, 8-10 May 2019. Can the Australian dairy industry be saved? Woolworths has launched a private label ‘ready-to-heat’ meal range called ‘Woolworths Simply’. The prohibition of ‘superfood’ hemp is over.